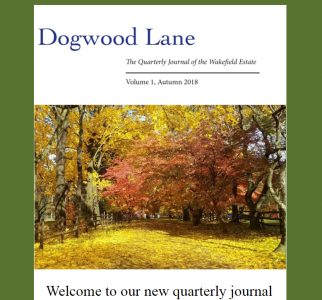 We are excited about the launch of our new quarterly journal, entitled "Dogwood Lane." Each quarter, Dogwood Lane will focus on a different aspect of our programs and work of the Mary M. B. Charitable Trust. 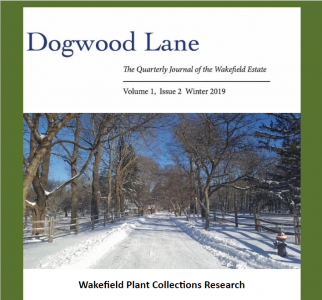 The first edition provides a deeper understating of how we carry out our mission to "promote life-long participatory learning using the resources of the Wakefield Estate," with a focus on three of the estate's educational programs. We hope you will take a few minutes to read it and will enjoy learning more about our work. We'd love to hear what you think! Click here to read Dogwood Lane Vol. 1, Issue One - Wakefield Estate's educational programs, or click on the menu tab above at the right. Click here to read Dogwood Lane Vol. 1, Issue Two - Horticultural Research at the Wakefield Estate, or click on the menu tab above at the right.